Since many days I was thinking about to write to "why people quit blogging", after all I found, there is only one strong reason behind this, that is they unable to make money blogging, if you are having same reason to quit blogging then you are doing blunder mistake dear. Because bogging can not make you money from 6 months or even one year, that's why you can live with that, because it takes time to build visitors(returning and new visitors), more important is what you are providing on your blog for people. Few things you must know about blogging, among of those things one most important thing is content of your blog, nothing others matter, if you are providing quality contents then no one can stop you to become a blogger, what you wanted to be, but remember do create a post often, because when your returning visitors will come to your blog they will find some thing new. In this article I am going to share with you somethings, those things will help you, not to quit blogging, that's why you will keep blogging and one day you will become famous blogger. See no matter on which niche you are blogging, there are definitely some bloggers, those bloggers are writing on the topic those probably you are going to write, so always Google on the topic, on which topic you are going to write an article, then if you found any article, then read the article completely then understand, what the article is missing? Now start writing the article, don't forget to provide subheadings in between the blog post to make better look of the article. This is one the biggest thing you have to learn and keep learning, because after all people will read your article, if they will not understand your article then, how could be possible they will come to your blog again, make sure you are writing an article, which will make understand your readers, to proof it, just read the article after writing it and if you found any mistake, then correct it. It will help you to become a professional blogger. See motivation is most important to keep your self on the same pace or even better, pace is every thing to do something crazy in our life. May be you are thinking, where the hell you are going to get motivation, then let me tell you dear, there are many books to get motivation but don't read any book, read other blogger success stories which will definitely recharge your mind to keep blogging and keep blogging is the way to success in blogging but with this keep learning. After one month of blogging write about your achievements through blogging, let me help you more, you can write about your blog traffic, comments, you may also write about other bloggers achievements. See there are many ways to become a famous blogger but you have to find out your own way, which will definitely help you to become one of the top blogger in the world. There are many types of bloggers some of them are newbies, pro bloggers(professional), to be professional bloggers, student bloggers, part time bloggers. As I have noticed most of bloggers do not care about their readers, that's why they will never succeed in blogging, because in blogging everything is your readers, so never forget about them, because it will definitely kill your blogging career. Do care about them! One of them caring for readers is reply on comments, you don't need to write any lengthy comment, just write thank you, thanks for reading, it will help you to make that particular visitors or may be other visitors to be happy, that you care for them. It shows professionalism. I am updating this blog post, because I have learn few more tips and tricks about blogging those really needed. Well, if you are just started out blogging then I will recommend you to read my full proof blogging guide. Okay, I know you are going to get lot of information from that detail blog post. But, here I am going to share with you few secret sauce of blogging in 2014, see if you want to get success in blogging, then you need to concentrate on few things. First Learn Basic SEO< then decide topic to write on your blog<then see potential visitors for particular keyword< Now start blogging. But, in the beginning you are not going to help from search engines, that's why I will suggest you to use social medias as well as build your own list of e-mails. One more tips and tricks I would like to share with you, which was my recent successful experiment for new blog. Here, I'm going to show you proof of driving huge traffic in a day from Facebook, after a successful experiment my planning to drive more traffic from Facebook and of course free. Actually, I am break the process I did step by step that's why you can do the same, well I have just analysed the need of people those are my friends and just post the article link and Tag few important people. 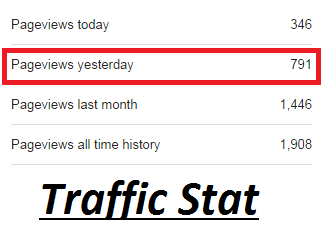 After looking stat any one can say about the blog, its a new blog and the blog only having 1908 visitors life time and what I did to drive 791 page views in a day. The steps I told you earlier. I hope this tip will help you to drive lot of traffic to your blog, if you can do it let me know, I will post here your story. Blogging is not one day job, that's why it is called blogging keep going(learning, thinking, writing, any thing else you do). Then you will succeed in blogging, it will definitely take few months may be years but don't worry you will become famous, if you are really solving problems for people.